1. The weight of an adult horse’s brain is about 22 ounces. That’s about half the weight of the human brain. A horse’s heart, however, can weigh as much as 10 pounds. 2. Horses enjoy sweet flavors. Most of the time, they will not eat anything that has a bitter or sour taste to it. 3. In moderate climates, horses will generally drink about 25 gallons of water each day. In hotter climates, they will drink much more than that. 4. 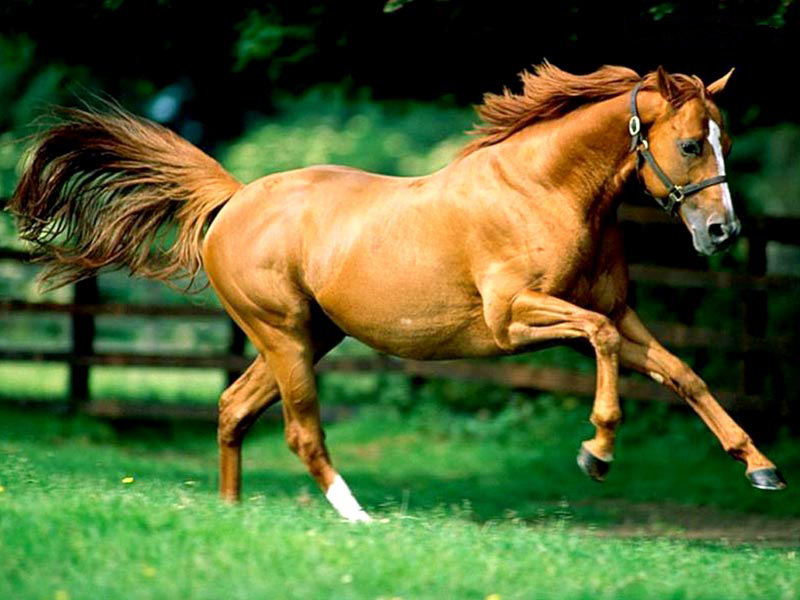 A horse can rotate each ear 180 degrees because they have 16 muscles in each individual ear. 5. Horses were first domesticated by Mongolian tribes about 5000 years ago. 6. You should always beware when standing behind a horse because they can kick at any time. But if the horse has a red ribbon on its tail, be extra careful because that means it has kicked before. 7. Horses that are younger than one year old are called foals. When they are between one and two years old, they are called yearlings. A colt is a male horse that is between two and four years old and a filly is a female horse of the same age. Mares are female horses older than four years old. Geldings are male castrated horses over four years of age and stallions are male horses over four years old that have not been castrated. 8. Horses only sleep a total of between three and four hours a day, and they usually only sleep between 10 and 15 minutes at a time. They can sleep when they are lying down or while they are standing up. 9. Horses are measured in terms of “hands.” A “hand” is equal to four inches. So if a horse measures 15 hands tall, that means they are 60 inches tall. 10. A horse typically takes on the mood and emotions of its owner. If the owner is in a good mood, the horse is generally going to be well-behaved. But if the owner is in a bad mood or angry, the horse is likely going to show signs of those emotions as well. 11. The leading cause of death in horses is colic, which is a digestive issue that is caused by intestinal obstruction. Since horses cannot physically vomit, they have digestive problems which often lead to colic, and ultimately, death. 12. A young foal can stand up and start walking within just a couple hours after it is born. 13. The oldest recorded horse – Old Billy – lived to be 62 years old! 14. Horses have the biggest eyes of any animal that lives on land. 15. Horse hooves are made from the same protein compound as human hair and fingernails. 16. As herbivores, haorses generally eat grass and hay as the majority of their diet. Working horses also eat oats, maize, barley and bran to give them extra energy. Due to their small stomachs, they cannot eat a lot at one time so they have to eat small portions more often. 17. The typical life span for a horse is between 20 and 25 years, although some have been recorded to live for 30 years. 18. A horse’s hooves continue growing and need to be trimmed every four to six weeks. After getting trimmed, their hooves are fitted for new horseshoes. 19. Horses have four natural gaits, or paces. They are the walk, canter, gallop and trot. 20. Horses often communicate with their tails. The way they swing their tail is often an indication to other horses about how they are feeling. 21. Contrary to popular belief, a pony is not a baby horse. It is a full-grown horse that is just much smaller. 22. With the exception of one blind spot directly in front of them and one directly behind them, horses have 360 degree vision. 23. A horse’s stall needs to be cleaned constantly because they can defecate more than a dozen times every day. 24. Horses, by nature, are not made for jumping. If they encounter obstacles and they are on their own, they will go around the obstacle rather than jump over it. 25. Horses enjoy being around people and other horses. They do not like being left by themselves.